Flamenco Taps are danced from a Spanish Line in Inverted Counter Promenade Position or Promenade Position without hold. Man and Lady are dancing the same steps on opposite feet. 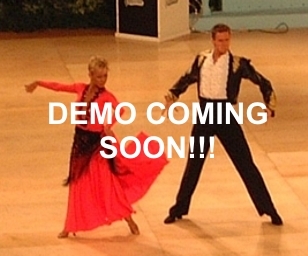 When danced in Inverted Counter Promenade Position Man, commences with the left foot and lady with the right. When danced in Inverted Promenade Position, man commences with the right foot and lady with the left. The Spanish Line shape is retained throughout the step. The Flamenco Taps are commenced with the left foot are described in the charts. Newcomer: Natural Turn, LF Change Step. Bronze: Natural Turn, 4-6 Natural Turn after Back Lock or Progressive Chasse to R.
Silver - Gold: Outside Spin taken after Open Impetus and Cross Hesitation makinga full turn to end facing DC. Newcomer - Gold: Any figure that starts forward on right foot. Replace weight forward to RF, toe turned out " " " "
Tap LF behind RF on toe, L toe behind R heel, toe turned out " " " "
3 & Repeat step 2 - another tap " " " "
LF back small step, toe turned out " " " "
Place RF into Spanish Line Position " " " "
Extend LF back without weight, toe turned out " " " "
Tap LF behind RF as step 2 " " " "
Place RF into Spanish Line Pos. " " " "